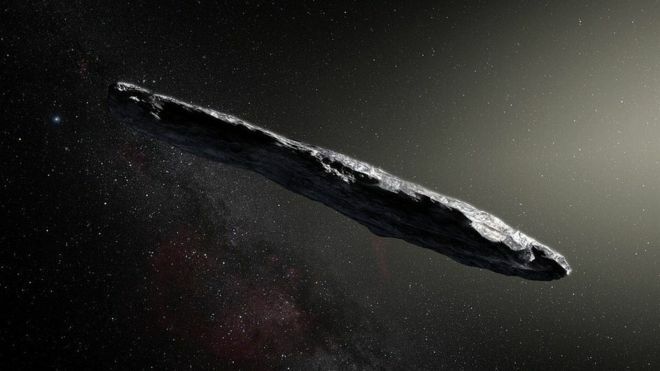 A story on the BBC website reports that the interstellar visitor object, Oumuamua is being examined for signs of alien technology. Billionaire Yuri Milner will be funding a project, making use of the Green Bank Radio Telescope in West Virginia, to listen for any signals (intentional or not) that would indicate a non-natural source. That might include actual attempts at communication, or radio signals that leak from the object unintentionally, say from some type of electrical machinery. Even an unexplained heat signature would be of interest. It seems like a real long shot, but then the term “long” is very apt for this object, as it is very unusual for its long shape, about a 10 to 1 ratio of long axis to short axis. Contrary to what one might expect based on pictures in the media, we haven’t actually been able to photograph it in the glorious detail generally shown, as above. Those are artist renderings. In fact we haven’t really been able to photograph it at all, as far as its shape is concerned. From the distance at which we have observed it, it is just a speck of light, albeit a speck that varies in brightness. Why don’t we have nice photos? Basically, it is too small. It is thought to be about 800 meters long, by 80 meters wide, by 80 meters deep. A little trigonometry shows that an 0.8 km object would subtend an angle of about 0.016 arc seconds, even at the relatively close distance of 10,000,000 km. The telescopes and cameras that were used to photograph Oumuamua had a resolution, at best, of only about 0.1 arc seconds per pixel, so it can’t really be seen as an extended object, at the distances at which it has been observed (it was at roughly Mars-like distances when first observed, as indicated in the picture taken from the Nature paper). The magnitude scale is constructed so that a difference of 5 magnitudes equals a difference of 100 time in intrinsic magnitude. Another way of looking at that, is that each magnitude change represents about 2.5 times change in brightness. So, 5 magnitudes is about 2.5 raised to the fifth power, which is about 98. A difference of 2.5 magnitudes is about 2.5 railed to the power 2.5, which is 9.88, or nearly 10. 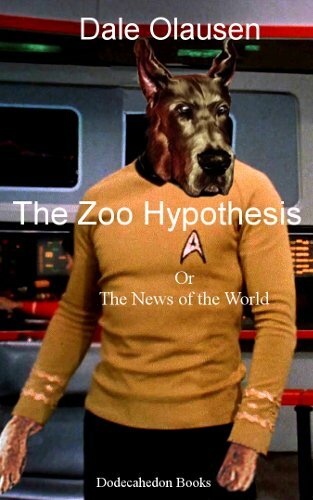 Note that I am making some approximations here, but they are close enough for the purpose, given the uncertainties in observational data, anyway. The most likely reason for this change in brightness is that it is that Oumuamua is rotating every 8 hours, with its short profile facing Earth when it is dimmest and its long profile facing Earth when it is brightest (like a North American football tumbling end over end after a kick-off, as observed from the kicker’s point of view). So, the difference of a factor of 10 in brightness would be due to the change in the amount of surface area facing the Earth, and thus the amount of reflecting surface that is reflecting sunlight back to us. An Underestimate of the Elongation? On interesting aspect of this explanation, is that the 10 to 1 elongation estimate might well be a significant underestimate, depending on the angle of Oumuamua’s rotation plane, as seen from the Earth. I mocked up a model of the interstellar asteroid, with approximately the same ratio of dimensions as Oumuamua. This was a piece of scrap wood with dimensions of about 15 inches by 1.50 inches by 1.75 inches. That’s pretty close to the 10 to 1 elongation of Oumuamua. I then mounted this on a tripod, using some good old duct tape. The tripod could be rotated in all three dimensions. That was then placed next to a wall with a light source across the room. This was meant to very roughly model the situation of the asteroid, relative to the Earth, with the size of the shadow on the wall corresponding to the amount of area that the asteroid would present to the sun, and thereby the amount of light being reflected back to an observer on Earth. This exercise is also a straightforward example of projecting a 3-D object onto a 2-D surface (more trigonometry), but a picture is worth a thousand words, so I thought this would be interesting an persuasive in illustrating the mathematical situation. I have named this the “propeller” in the images below. One can think of how a spinning propeller would look to an observer, at various angles. Remember, though, that the propeller is rotating very slowly, about once every 8 hours, so the apparent size of it can be easily measured at various stages in the rotation. Note also, that the pictures had to be taken at a bit of an angle, otherwise there would be no shadow to measure, since the photographer would block the light (“shades” of the observer affecting the observation). So, the photos are a bit distorted, relative to the shadow measurements actually taken with a tape measure. Case 1 is the situation that is yields the maximum ratio of length to width/depth. When the asteroid model is pointing straight up and down, relative to the observer, its shadow measures about 17 inches long by 1.75 inches wide (the shadow is a bit longer than the model, because the light source is a non-spherical light bulb about 10 feet away, so there are some complicated penumbra effects). When it is pointing sideways, relative to the observer, it measures about 1.75 inches long by 1.75 inches wide. So, that yields an elongation of about 10, which is the elongation estimated for Oumuamua in the reports. Case 2 is the situation that is yields the minimum ratio of length to width/depth, which is to say no elongation at all. When the asteroid model is pointing straight up and down, relative to the observer, its shadow measures about 16 inches long by 1.75 inches wide. When it is pointing sideways, relative to the observer, it measures about the same. So, that yields an elongation of about 1, or no elongation at all. So, if a long object (but relatively small) was to fly away from us, spinning like a propeller face on, we wouldn’t really know anything about its shape, as it would seem equally bright throughout its rotation. Case 3 is an intermediate situation, with the plane of the propeller at about 45 degrees to the observers line of sight. When the asteroid model is pointing straight up and down, relative to the observer, its shadow measures about 16.5 inches long by 2.25 inches wide. When it is pointing sideways, relative to the observer, it measures about 13.5 inches long by 1.75 inches wide. So, that yields an elongation of well under 2, or not much at all, event thought we know that the dimensions of the object are actually 10 to 1. So, for such an object oriented at an oblique angle, we would be seriously misled about its real size. The same is true for other oblique angles – even an object inclined only 30 degrees from straight-on yields a fairly small apparent elongation, on the order of 2. So, Oumuamua is a weird shaped object, at least 10 to 1 ratio of length to width, according to the light curve. But, from this little modelling experiment, it seems likely that it is actually considerably more elongated than that, given that it is probably not at the most favorable angle to estimate elongation via the light curve. So, that means that it probably goes from being a weird object to a very weird object, at least as far as this simple modelling experiment is concerned. I should note that an early version of the Astrophysical Journal paper alludes to this issue noting that the “axis ratio is a lower limit because of the effects of projection, and is extreme relative to most asteroids”. "Slenderness" is an engineering definition. Structural engineers generally consider skyscrapers with a minimum 1:10 or 1:12 ratio (of the width of the building's base to its height) to be "slender." Slenderness is a proportion based on the width of the base to the height of the building. The World Trade Center North Tower was the tallest building in the world on its completion in 1971. 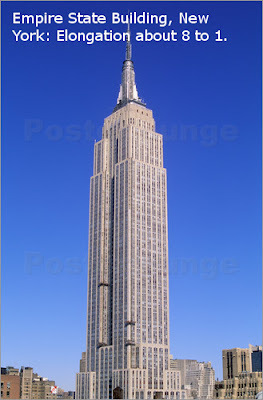 But at a height of 1,368 feet and with a big square floor plate, 209 feet on each side, the ratio of its base to height was less than 1:7. 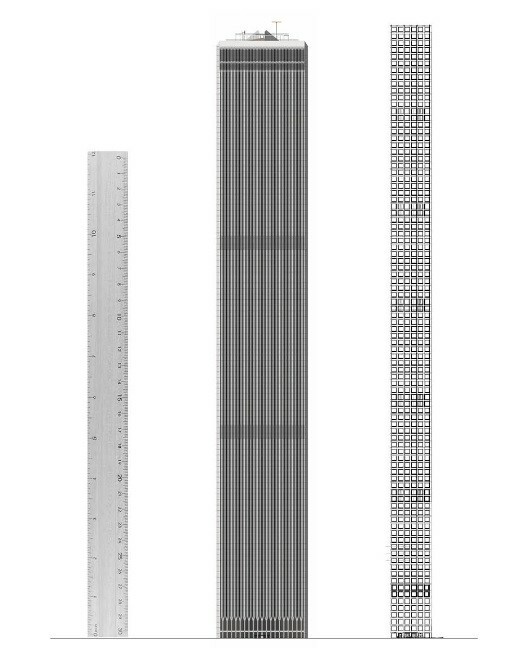 This image compares at the same scale the former 1 WTC and the residential tower 432 Park Avenue, now under construction. The base of the apartment building is 93 feet square, and the shaft will rise to 1,396 feet, making its slenderness ratio 1:15. To visualize a 1:12 ratio, we show a ruler 1-inch wide and set on end. The eighteen towers on our chart range from a ratio of 1:10 to an extraordinary 1:23 at 111 W. 57 Street. Here’s a photo of the Empire State Building, in New York (which is not considered a slender building). It has an elongation of perhaps 7 or 8 to 1, based on floor space, number of stories, and overall height. It is hard to find a natural rock formation on Earth that comes anywhere near a 10 to 1 elongation. 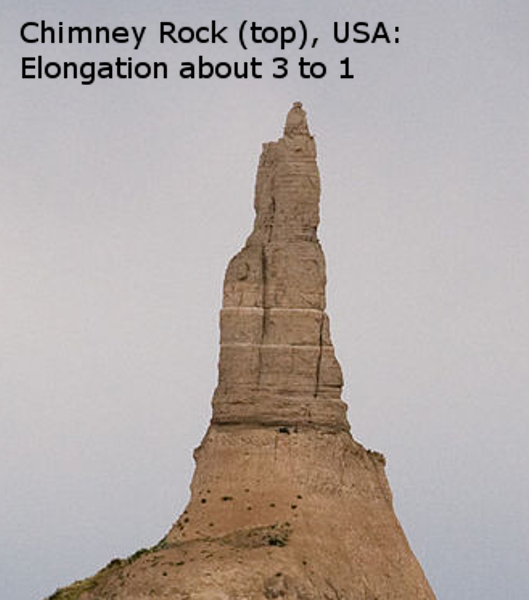 Here’s the well-known Chimney Rock, in the U.S.A. (Nebraska). It only looks to be about 4 to 1 elongation, on average, considering just the top spire. 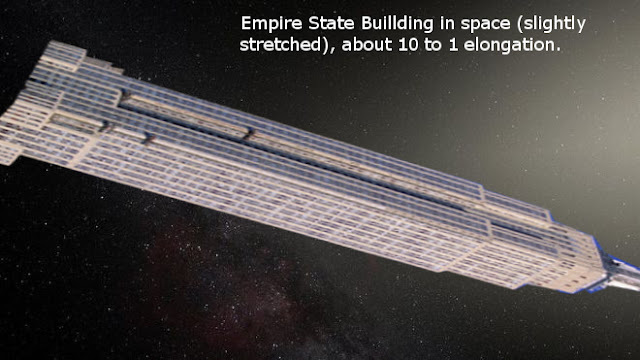 So, if you observed Oumuamua from a spaceship, very close up (like the recent ESA mission to the comet), its shape might remind you of a skyscraper, and possibly an extremely skinny one (though if it looked too much like the Empire State Building, you might be running short of oxygen). As far as we know, there is nothing like it in our solar system. The question is, what process made such an unusual object (see my earlier Oumuamua blog for more on that). I guess that’s the question on Russian billionaire Yuri Milner’s mind as well. Now that you have read about a real interstellar interloper (natural or not), you should consider reading some Science Fiction. How about a short story, also about interstellar interlopers. It also features one possible scenario to explain why we haven’t met ET yet (as far as we know, anyway). Only 99 cents on Amazon. Oh, and it has dogs. Everyone loves dogs, don’t they? The short story is about 6300 words, or about half an hour at typical reading speeds. It will set you back 99 cents, unless it is free, which it occasionally is.